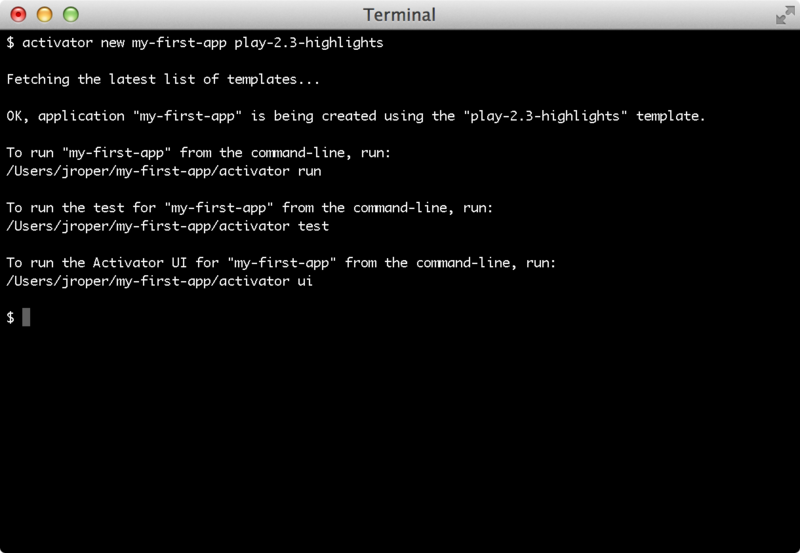 The activator command can be used to create a new Play application. Activator allows you to select a template that your new application should be based off. For vanilla Play projects, the names of these templates are play-scala for Scala based Play applications, and play-java for Java based Play applications. Note that choosing a template for either Scala or Java at this point does not imply that you can’t change language later. For example, you can create a new application using the default Java application template and start adding Scala code whenever you like. In either case, you can replace my-first-app with whatever name you want your application to use. Activator will use this as the directory name to create the application in. You can change this name later if you choose. If you wish to use other Activator templates, you can do this by running activator new. This will prompt you for an application name, and then give you a chance to browse and select an appropriate template. Once the application has been created you can use the activator command again to enter the Play console. You can read the documentation for using the Activator UI here. It is also possible to create a new Play application without installing Activator, using sbt directly. First install sbt if needed. Create a new directory for your new application and configure your sbt build script with two additions. resolvers += "Typesafe Snapshots" at "https://oss.sonatype.org/content/repositories/snapshots/"
sbt will load your project and fetch the dependencies.